FITCHBURG — For a small institution, the Fitchburg Art Museum has a permanent collection of impressive size. It owns about 5,000 objects. That number is going to increase by 10 percent. Last November, the museum announced a promised gift of 500 photographs from Anthony Terrana. It’s the largest donation the museum has received since its 1925 founding. The museum’s photography collection was already strong. Its 450 photographs include works by Ansel Adams, Walker Evans, Dorothea Lange, and Garry Winogrand. The Terrana bequest complements those holdings. It favors, without being limited to, large-scale color photographs of the past three decades. In that sense, the Terrana pictures are an update as well as an addition. The 24 pictures in “People and Places: Contemporary Photographs From the Collection of Dr. Anthony Terrana” offer a vibrant sampling. The show has been organized by Stephen Jareckie, the museum’s consulting curator for photography. It runs through May 20. Some well-known artists have work in the show: Abelardo Morell, William Wegman, Olivia Parker, Joyce Tenneson, Laura McPhee (a collaboration with Virginia Beahan). 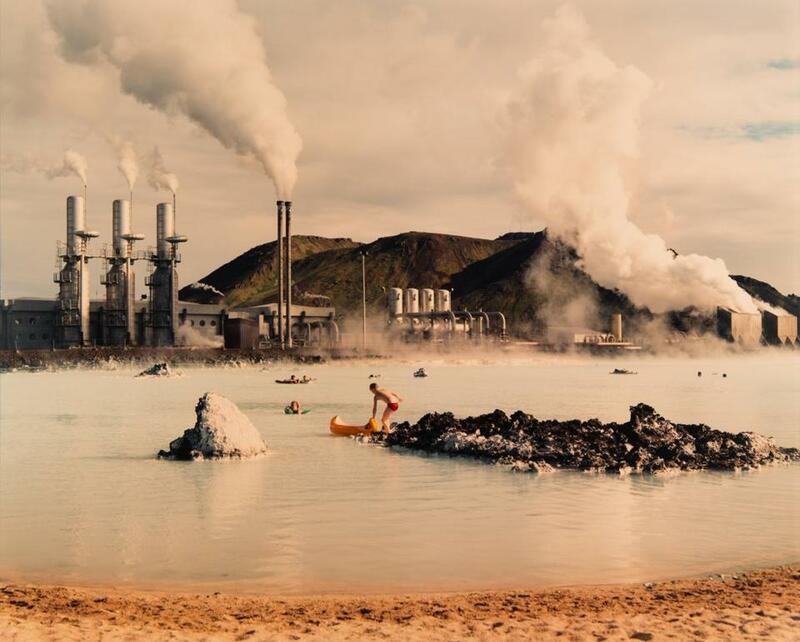 Their picture, “The Blue Lagoon,” is striking in and of itself. It shows swimmers and canoeists enjoying, if that is the word, some hideously unnatural-looking water. One presumes the source of the unnaturalness is the industrial plant that looms in the background, smokestacks belching. What makes “The Blue Lagoon” all the more striking is its hanging next to a very different rendering of water and blueness, Lynne Cohen’s “Pool” — pool, as in indoor and chlorinated. The image is a model of cool, gorgeous restraint. The juxtaposition is inspired. Several photographers have two images in the show: Parker, Rania Matar, Marc McAndrews. 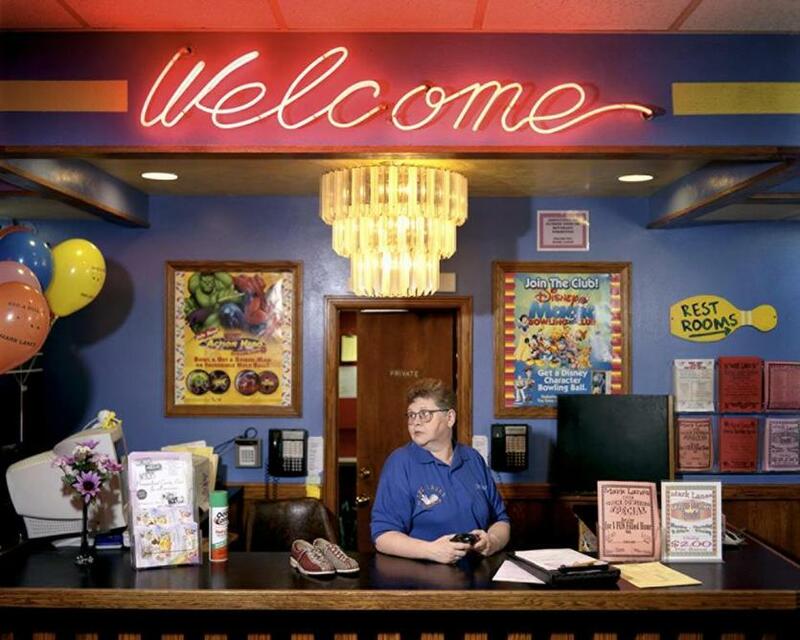 McAndrews’s “Welcome” offers a straight-on, here-it-is view of a bowling alley’s front desk. The only thing that isn’t straight on is the clerk, who’s looking off to the side. You’d look off to the side, too, if you were surrounded by such an oddball array of colors and items. “People and Places” offers a slice of the new. “Mirrors and Windows: Photographs From FAM’s Permanent Collection” bows to the old. Old is a relative term, of course. Most of the 25 photographs are from the second half of the last century or the early years of this one. The oldest is the choicest: an 1894 Alfred Stieglitz photogravure of Venice. Stieglitz is among several starry names in the show: Charles Sheeler, Ezra Stoller, Paul Caponigro, Berenice Abbott. The Abbott is her famous 1935 New York street scene, “Blossom Restaurant.” It hangs alongside Jules Aarons’s view of a Queens delicatessen and Michael Thomas’s of a store in Hop Bottom, Pa. (Yes, “Hop Bottom”: This really is a great country, isn’t it?) The three commercial storefronts are an example of the keen eye curatorial fellow Lauren Szumita has used in hanging the show. Those storefronts are examples of windows. The exhibition consists of just what its title says: images of mirrors and windows. Some of those windows are the kind that hang on walls. Some are the mirroring that comes of the reflectivity of water. 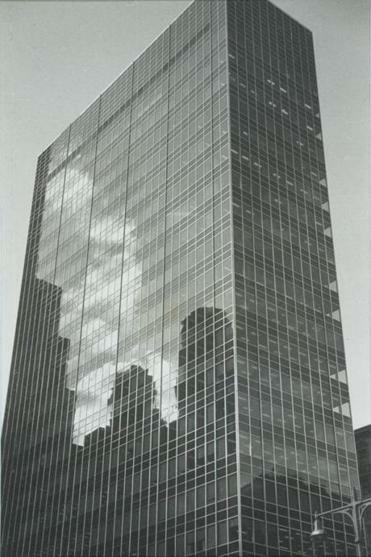 The title of the Stieglitz is “Reflections — Venice.” Sheeler’s view of Lever House, the pioneering New York skyscraper, is a two-fer. It shows hundreds of windows that, yes, mirror the building’s surrounding. Visitors to the museum should also seek out Dave Cole’s “The Music Box.” It’s part of “Fantastical, Political,” which runs through June 3. Cole’s is a music box like no other. It’s a Caterpillar roller-compactor, just like one a public works department might use. Except that attached to the roller is a handsome piece of cherry wood with xylophone-like bars on top. That’s where the fantastical comes in. The political enters the picture when the roller turns. The resulting “music box” plays “The Star-Spangled Banner.” O say can you see? Oh, yes — and hear, too.